Homo neanderthalensis was the scientific name given to an unusual ancient fossil (later to be called Neanderthal Man) found in the Neander Valley near Dusseldorf, Germany, in 1856. It was later realized that fossils of H. neanderthalensis had been discovered earlier in Engis, Belgium, in 1830, and in Forbes’ Quarry, Gibraltar, in 1848. (For an extensive history of Neanderthal finds, see, for example, Trinkaus and Shipman 1993). 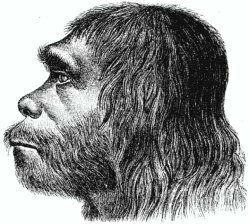 At that early time, these fossils were considered to be ancient, primitive humans by some (who called them “ape-man”), or diseased modern humans by others, but nonetheless human (Regal 2004, pp. 38–43). Reconstructions of what Neanderthals might have looked like when alive gave them a very satisfactory ape-like appearance (for example, fig. 1). In 1908, Neanderthal as a primitive, brutish, caveman was literally invented by Marcellin Boule of France (Regal 2004, pp. 51–52). That image of the Neanderthals was to persist for the next 50 years (Drell 2000; Schrenk and Muller 2008). It has been generally conceded by evolutionists, however reluctantly, that they would have to accept that Neanderthals were as human as we were (Lewin 1999, pp. 156–163). But evolutionists haven’t given up entirely without a struggle, and they remain ambivalent about the Neanderthals. Hints of the evolutionist difficulty with considering Neanderthals entirely human keep surfacing, as in questions of whether they could really talk like us, for instance (Hoffecker 2005; Krause et al. 2007a; Swaminathan 2007). Speth (2004) found it necessary to chide his fellow scientists for convicting the Neanderthals of gross mental incompetence without adequate proof (“By most recent accounts, Neanderthals would have had considerable difficulty chewing gum and walking at the same time.”). Fig. 1. First reconstruction of a Neanderthal man, by Schaaffhausen, 1888 (Neanderthal 2009). Young-earth creationists, meanwhile, were not at all reluctant to recognize Neanderthals as human (Oard 2003a; Phillips 2000; Robertson and Sarfati 2003); after all, they had known from the beginning that there was no such thing as an ape-man. Lubenow pointed out that at several sites Neanderthals and modern humans were buried together, which he considered to be strong evidence that Neanderthals were of our species, because “In all of life, few desires are stronger than the desire to be buried with one’s own people” (Lubenow 2004, p. 254). ← How Old Did Man Live for on the Early Earth?